Fish the beautiful Crystal River inshore shallow water species on grass flats and back country creeks. An all-inclusive offshore fishing trip in the Gulf of Mexico for up to 6 anglers on our large spacious boat. 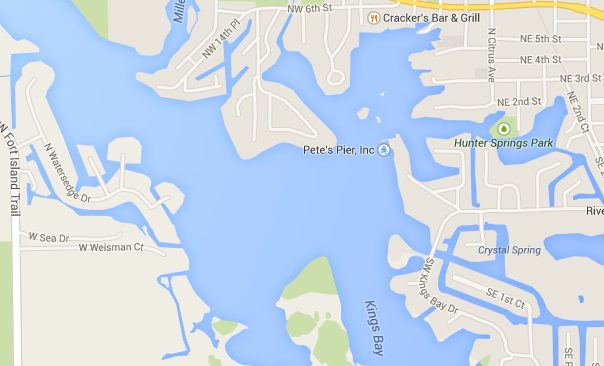 Head out to the grass flats in 3-5ft of water in beautiful crystal clear water and snorkel for scallops. Explore saltwater estuaries or inland lakes and marshes while hunting a variety of waterfowl. Very few places compare to the immense fishing experience provided by the tributaries at Crystal River. Due to its location at the heart of the Nature Coast, Crystal River offers both inshore and offshore sport fishing experiences. For inshore Captain Clay Shidler targets shallow water species such as Redfish, Snapper and Trout (and more) on the grass flats and back country creeks that have made Crystal River famous for fishing. When it comes to sport fishing, Crystal River has it all and Captain Clay Shidler knows how to provide you and your family a safe and fun fishing experience you will not forget. Loved this fishing trip. Clay quickly got us to our first fishing ground, set up and on fish. Within in 15 mins I snagged a Snapper. I would recommend Clay and his charter to anyone looking to have some serious fun and catch a bunch of fish. We specialize in family friendly offshore trips that everyone can enjoy. With help from my skilled deckhand Mike we ensure that you will have a great day on the water. A standard day trip departs at 7:30am and we normally return to the dock around 5:00pm with roughly an hour of fish cleaning to follow. These trips are all inclusive with high quality fishing tackle, fishing license, bait, and bottled water included in the price of trip. We put in the extra effort to make sure that each client is satisfied with their day aboard the Hang’ Em High. On a standard full day trip we target a wide range of species including Gag Grouper, Red Grouper, Cobia, Amberjack, Kingfish, Grunts, and Sea Bass. 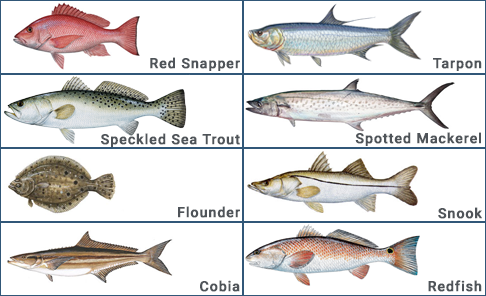 All of these species are found within 20-50 miles of Crystal River on a seasonal basis but we can target most grouper species on a daily basis. We allow our customers to keep as many fish as they would like per FWC regulations which change constantly. All fish are filleted and bagged for the customers for no additional fee. These trips usually begin at 7am where we load up our 36 ft Yellowfin and head out to the Gulf of Mexico. We return by 5 so that we have time to prepare your fish for your trip home. Our 37 ft Freeman is designed and built specifically for long range fishing trips boasting a cruising speed of 40-45 mph while maintaining a great ride. We specialize in catching as many species as possible. 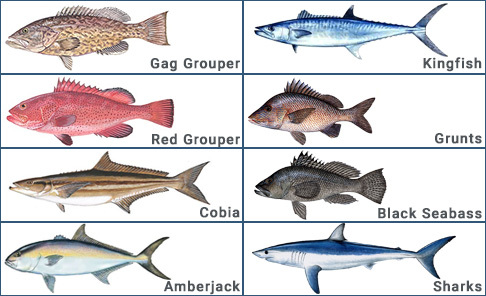 In addition to bottom fish we also target pelagic species such as Dolphin, Wahoo, and Blackfin Tuna when possible. 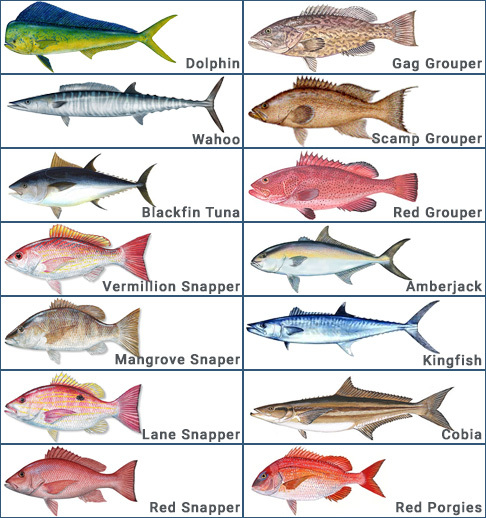 Our targeted bottom fish species are Vermilion Snapper, Mangrove Snapper, Lane Snapper, Red Snapper, Gag Grouper, Scamp Grouper, Red Grouper, Amberjack, Kingfish, Cobia, Red Porgies. With such a variety of species to target we have no trouble bringing home a box full of fish on these fantastic trips. 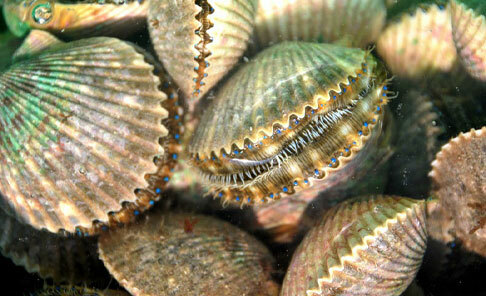 Scalloping is an adventure that is fun for the entire family. During the Scallop season we head out to the grass flats in 3-5ft of water and off of Crystal River and Homosassa where we snorkel around in beautiful clear water and pick up scallops. The scallops are normally sitting on top of the sea grass on the bottom and we dive down and pick them up. This is a fantastic for families as it allows people of all ages and skill levels to partake in the adventure. The average scallop trip departs from the dock around 8am and the customers normally have about 4 hours to fill the 2 gallon or 10 total gallons per boat limit. 4 hours is normally about the most amount of time that most people are comfortable spending in the water before they begin to get tired and worn out. All customers that are interested in scalloping should be comfortable using a mask and snorkel along with holding their breath and swimming underwater. 1st time scalloping for myself, my husband, and our 2 boys. Caught our limit in less than 2 hours, and then enjoyed snorkeling. Absolutely fantastic, can’t wait to go again! At Hang'Em High Sport Fishing we specializing in family friendly Back Country, Inshore, and Offshore fishing charters, scalloping tours and waterfowl hunting. Contact us for more details at any of the social media links below.